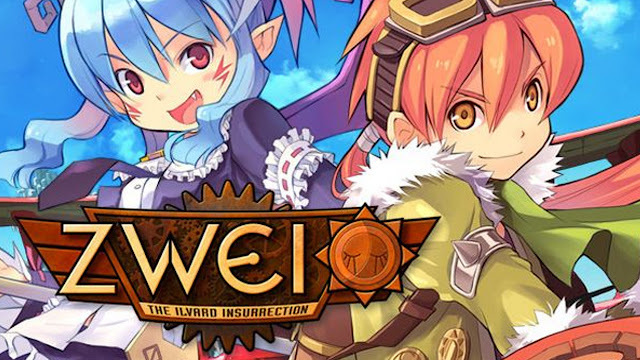 Zwei is a series originally released only in Japan, if I recall correctly, and the sequel Zwei: The Ilvard Insurrection, has made its way to North America, much to my pleasure. Introducing some interesting dual character mechanics, probably taken from the Zwei (German for two), provides a wonderful blend of monster mashing, puzzle solving, dungeon delving, and dancing that I’d be hard pressed to give a similarly done title off the top of my head. 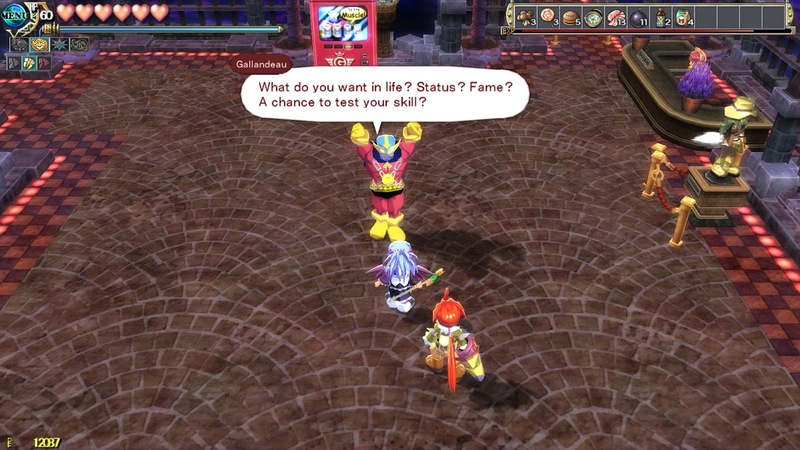 Despite this title being a sequel, you don’t really need to know anything about the first title, although you do meet characters from the first Zwei during the course of the game. In The Ilvard Insurrection, you take control of Ragna Valentine: treasure hunter, pilot, and delivery boy and Alwen du Moonbria, trueblood vampire and owner of a very fancy castle. Well, former owner, really. As Ragna is traveling to Ilvard to make a delivery, he is shot down by wyvern riding assailants, and Alwen pulls his bleeding almost-a-corpse body from the wreck of his plane, forcing him into a blood contract as her servant in order to reclaim her stolen castle and magic. 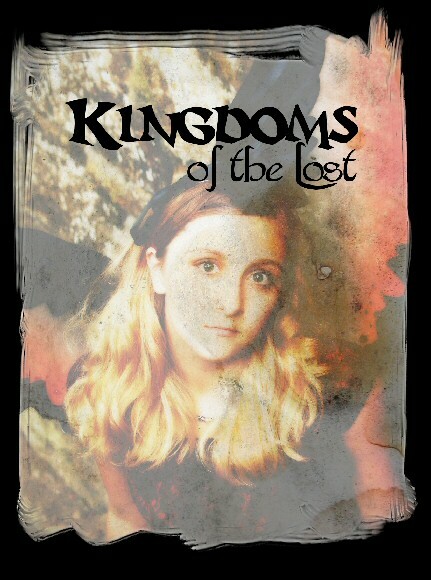 The two then begin their journey across Ilvard in order to reclaim Alwen’s lost property. As far as plot goes, the premise is actually rather refreshing, seeing as Alwen is technically considered a demon, which are normally hunted down as bad guys in, like, pretty much every game ever. What I found particularly nice was some of the banter, as none of the characters are particularly inept or stupid, despite a few shortcomings sometimes, and do actually learn from their mistakes, or their environment. For the most part of the game, characters tend to be rather genre savvy, and while the premise does devolve into slightly more clichéd as the story progresses, a lot of the problems I had with the plot were almost immediately lampshaded or deconstructed, which was nice to see. Gameplay is an interesting mash-up of beating up monsters and puzzle solving. You control both Ragna and Alwen, Ragna being the melee fighter and predominant puzzle solver, whereas Alwen is the ranged magic character. You can switch between the two at will, and if you prefer one of the other, like I preferred using Alwen, you can change the settings to keep a character out, instead of the default “attack only” swap. 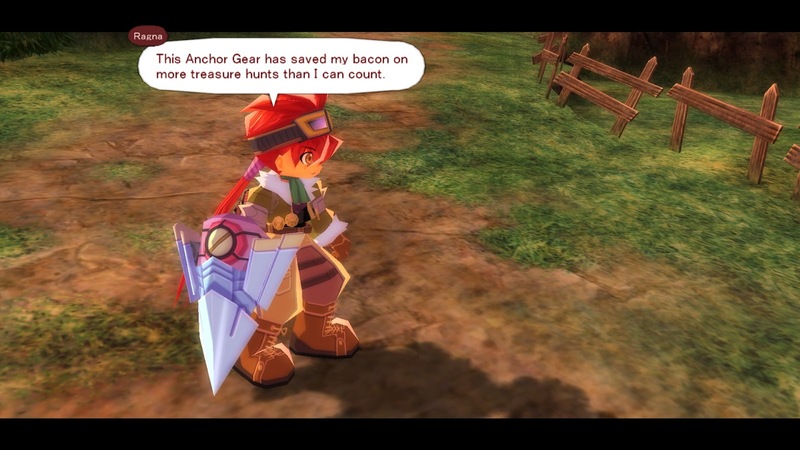 In terms of the combat, Ragna has an “anchor gear”, which is a fancy chain-blade grappling hook merging, and can be used to either smack some minions upside the face or grab enemies, or objects. Alwen starts with a single “magic missile” type attack, but will unlock more as you progress through the story. While Alwen is distinctly less useful in puzzle solving, her powerful ranged magic attacks can make some of the more powerful enemies a lot more manageable. One frightful thing I noticed when I first started was that Alwen didn’t regenerate MP, which is needed to use her spells, after use. 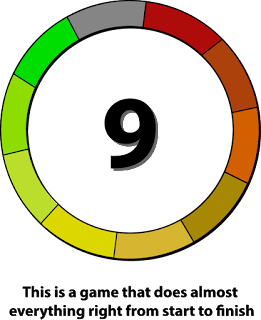 Instead, for the most part you end up draining your MP gauge and it will rapidly regenerate once it’s empty. 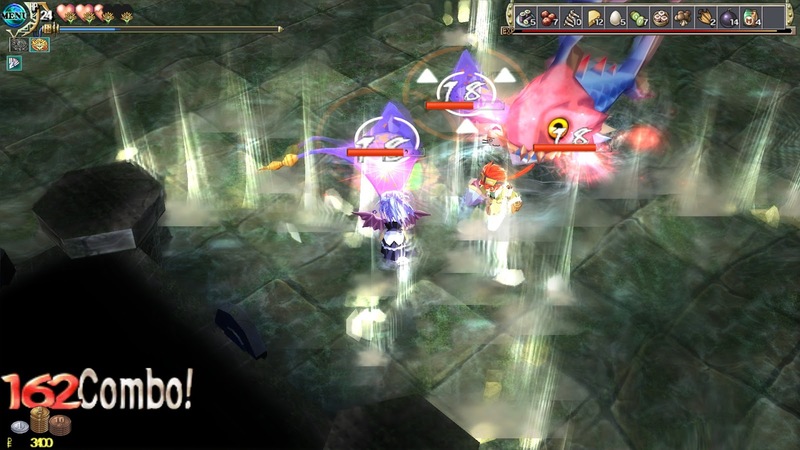 As you explore dungeons, you will collect money, food, and possibly bombs from enemies. While I hope you know how to use the money, the bombs can be used either as damage dealing tools or to break some very evident destructible rocks. The food is an interesting mechanic, as it not only heals you, but is also the only way you earn exp in order to level up. This means you’ll probably be balancing between scarfing food for more levels and hoarding food for health mid-dungeon. Unfortunately for me, I hoard everything. Meaning I was generally severely under-leveled until I decided to scarf down 18 eggs. Thankfully there’s a “food exchange”, where you can exchange 10 of a single type of food for one decidedly better piece of food, so my hoarding may have proved useful late game where there’s an egregiously stupid puzzle where you actually need to eat a set amount of food in-dungeon in order to get fat enough to weigh down a switch, but only if you have a certain item equipped. One especially nice aspect is that all items that enemies drop, provided they don’t fall in a bottomless pit, will bounce off out-of-bounds areas until they actually land in-bounds. During your adventures in dungeon delving, you can also bring along pets that pick up items for you, which I thought was a glorious addition. Except for one tiny little kink. They can also try and pick up bombs. Your bombs. The ones you drop to destroy walls or rocks. Now, while your pet can’t get hurt, they can move the bombs. Particularly away from the destructible object. And towards you. You can take self-damage from bombs. Another rather unique aspect of Zwei is the ability to customize your screen with “widgets”, which can either be earned through chests or bought, for the most part (pro tip, you’re gonna want the scale widget for the previously mentioned weight puzzle). These widgets can allow you to see enemy health and stats, and other helpful things. While these can get your screen cluttered, you can turn each one of them on or off and decide if you want the widget to show up on the left or right side of the screen. One really cool, although maybe not super useful, widget is a simple math game, where a basic math problem will appear, and you type in the number on your keyboard, and it will add a single point to your combo count. As you find yourself back in town, probably by using the surprisingly comprehensive warp system, you can interact with a cast of completely unique villagers, and animals too! There’s also a museum in town that you can check in with to upgrade your treasure hunter rank, or donate treasure for some pretty hefty sums of cash. In terms of graphical quality, I have to say, despite being made for the PS2/Vita/earlier PC, it still looks surprisingly good, although there might have been some graphic updates since its initial eastern release. The voice overs and mouth movements don’t really match up well though, so that is a bit awkward, but the actual voice acting was well done, despite the fact that the chibi-anime style 3D characters don’t always match the associated voice. There was a lot I really liked from Zwei, like how you can walk through towns on the world map, the stellar music, the nice variety of dungeon stages and puzzles (despite some puzzles being rather mean), and a really solid and funny plot and side banter. And the muscle dance. Oh my Gods, the muscle dance is amazing. And practical, surprisingly. Unfortunately not everything is ideal, such as the idle speech for your secondary character happens so often I found it got annoying rather fast, and if you’re attempting the illusory labyrinths or platinum ranks for the stages, expect to spend a lot of time in frustration, although that is a bit more to be expected. Eventually you will hit a point in the game where the only effective weapons are all fire based, and the only effective weapon you really have is fire based, which doesn’t particularly bode well for you. There was also a boss that I had no idea how to actually hurt for about ten minutes before I finally figured it out. 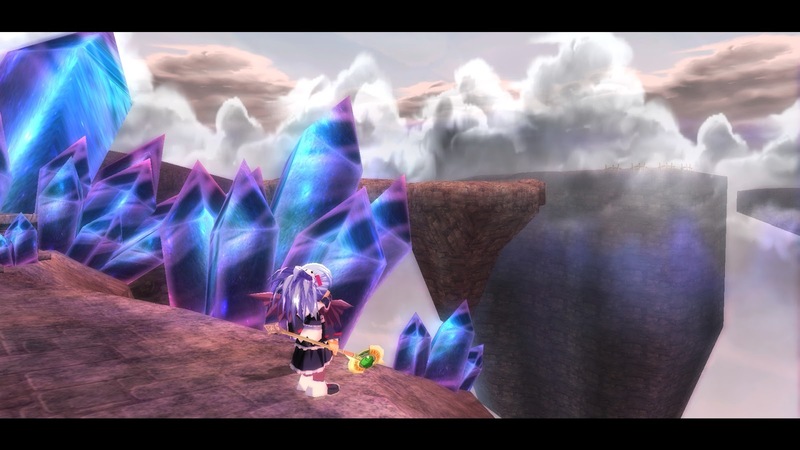 Overall, Zwei was an exciting, funny, and occasionally frustrating and sometimes quite challenging game. I found the vast majority of my experience to be really great, and despite the small setbacks, and the gravity dungeon, I really loved Zwei and would definitely give it a recommendation to RPG fans. 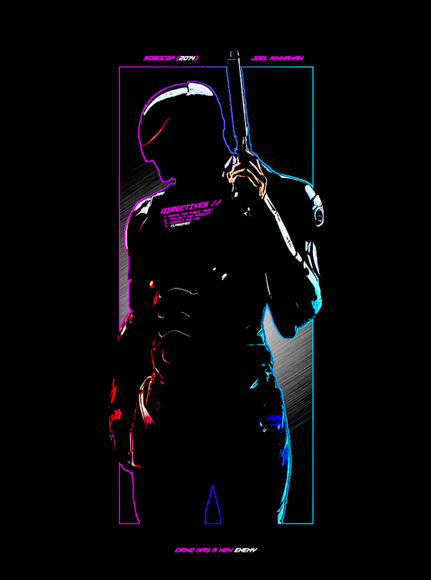 I really hope to be able to play the first installment at some point in time in the future.